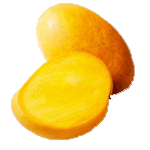 Also known famously as “Benishan”, this Mango is the most famous variety from the Andhra Pradesh region of India. It has a unique sweet taste and is moderately juicy. It is maize yellow in color with shining skin and fiberless firm flesh. Who says love cannot be measured- it oozes by heaps and pounds in this mango. The loyalty that this mango enjoys can make anyone envious. Ask about other Mango from someone who has grown up on this Mango and you will get an empty stare- can one even think of anything else when this exists!! The season for Banganpalli is between mid-May and mid-June.